There's actually a technique for changing lanes on a course with multiple sets of parallel tracks. And you have to plan your change. If you don't, you may lose your momentum. If you plan well, you can actually increase your speed during the lane change. 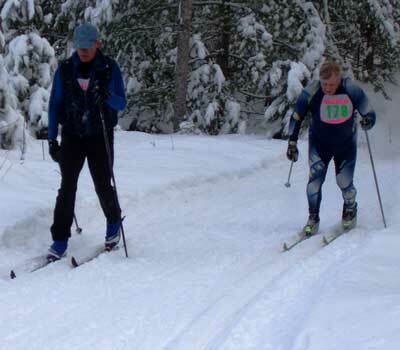 Ernie doublepoles up behind the other skier. He's already planned his lane change as he approaches. Ernie has good speed as he begins the lane change. 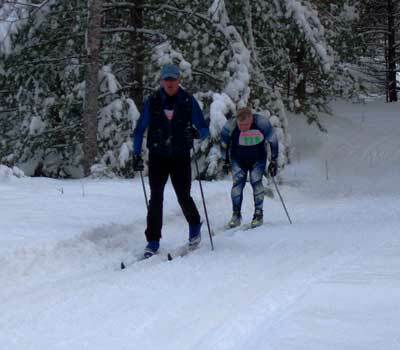 To initiate the change, he starts from a low body position, transfers all his weight to his right ski, and pushes off. Essentially, he's skating off his right ski onto his left ski. 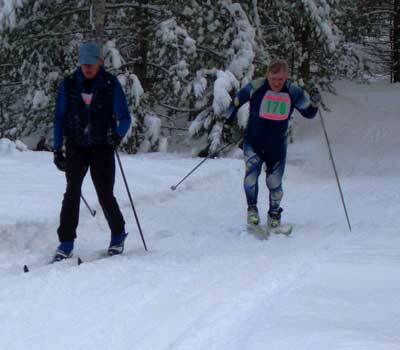 The right ski stays in the track during the push off. Once his left ski touches down, it goes straight until the end of move. Ernie has enough momentum that he does not need to doublepole between the lanes. Ernie has two options here: he can let his left ski ride beyond the other track, allowing him time to maneuver his right ski into the track. 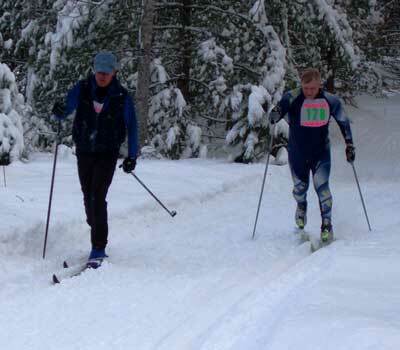 He then would transfer his weight off his left ski onto his right. When he does this, he's skating off his left ski onto the right ski. This is a legal FIS classic technique. Unfortunately, there's a bank of snow close the tracks, and there's no room to let the left ski ride beyond the track - he'd just bury his tip in the snow bank and crash. Instead, he pre-turns his left ski into the track. His right ski follows. Ernie's now completed his lane change and is passing the slower skier. Practice make perfect. Find a double track and practice, practice, practice, making lane changes in each direction. You can skate out of one track and then into the other track. That's it. Any other skate is illegal. Between the tracks, the skis need to stay parallel to each other. You can doublepole, kick doublepole, and diagonal stride between tracks, but no skating. Because there's a legal skate move allowed, you can actually increase your speed - great when you're setting up for pass. You can use the move to cut off a corner. 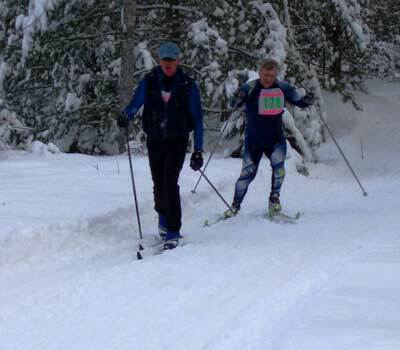 At the Crystal Mountain Highlander Classic Race, there was a wide trail with a track set on one side. On tight corners where the track was toward the outside edge of the trail, racers would "change lanes" out of the track toward the inside of the corner, doublepole straight though the inside and back to the track on the other side of the corner, then complete the lane change back into the track. You can also use the same move at intersections: "lane change" out of one track into the intersecting track. You can use the move to cross multiple tracks. At the 2006 Black Mountain Classic, there were around 10 lanes going around corners. Racers would lane change out of one track - with as hard a skate as possible, doublepole across multiple tracks, then complete the lane change back into a track.